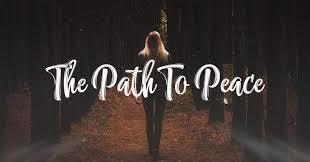 UU A Way Of Life: What is the path to peace? Do Unitarian Universalists want peace? It is mentioned in the sixth principle as "the goal of world community with peace, liberty, and justice for all." The way the principle is worded would make one think of political peace more than spiritual peace. Catholics make a big deal out of spiritual peace asking worshippers to extend to one another the wish for peace during their worship services and ritually say, "Pax vobiscum," peace be with you during their liturgies. Peace is considered in the perennial psychology as a major sign of spiritual attainment. It is inner peace that is being referred to however. The third step of the twelve step program for people in recovery is to make a decision to turn our will and our lives over to the care of God as we understand God. This decision to "turn it over" comes after the dawning that there must be a better way. This turning initiates the search. What is that better way? What does it look like? How can I stay on the right track and not get lost again? Are there trail markers I should look for or am I to blaze the trail all on my own only following an intuitive compass that points at God's will for me? What are the differences I should be alert to to discern the differences between the path of the ego and the path of the spirit? The two biggest trail markers on the path of the spirit are: What is the loving thing? and Will this bring us peace? Notice the word "us". What will bring "us" peace includes "me" but not "me" alone. My relationships with others must be brought into consideration as well. The body is the not the temple of the Holy Spirit as so many of us have been incorrectly taught. The temple of the Holy Spirit is in relationships. Remember the Jesus said, "Where two or more are gathered in my name, there I will be." Jesus was referring to the Divine when He said "I" not his personification. Giving up our ego is a scary thing. We feel like we are giving up control, and indeed, we are intentionally giving up control, and turning it over to the Divine. We come to not only learn that we are not in control of the universe but we gladly give up the fantasy and illusion. Let it go. There are far greater things going on than we could ever understand. Give up our attempts to control every thing. As they say in AA, "Let go and let God." A genuine surrender is the path to peace.